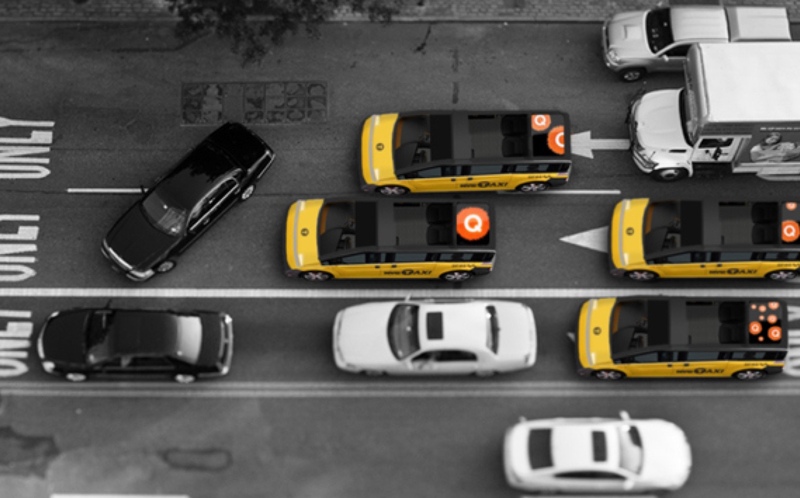 When overseas auto engineers, Karsan, made a bid to deliver New York’s built-to-spec Taxi of Tomorrow, they invited Turnstone Consulting to advise them on their strategy for a connected cab. Karsan was short-listed and heralded as the popular choice. The rest is history…and politics. What if the roof of a GPS-enabled cab were a media surface? At intersections, messages could coordinate across vehicles. 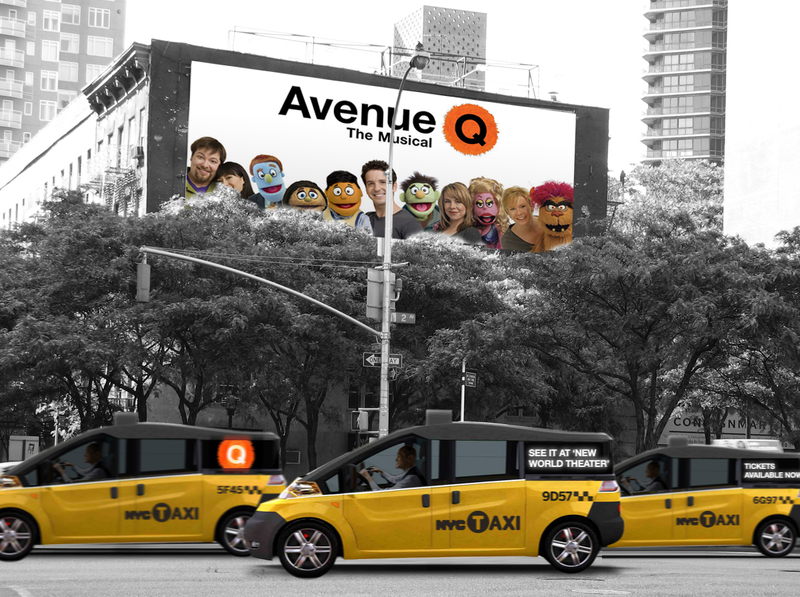 What if cab media was dynamic, location-sensitive, coordinating with billboards and landmarks? Before Spotify and Uber joined forces, we asked, what if passenger screens knew who's riding? In spring 2010, Karsan, an established European auto engineering firm, bid to win New York’s $1bn Taxi of Tomorrow contract, to build, distribute and run a fleet of built-to-spec yellow taxis before Mayor Bloomberg leaves office in 2014. Drawing from recommendations in Roads Forward: Taxi07, the winning vehicle must meet the City’s stringent requirements for safety, comfort, good value, fuel efficiency and standout look and feel. In November 2010, Turnstone proudly reported that the City has shortlisted our client, Karsan, alongside Ford and Nissan for this bid. NYC then invited everyone to vote for their favorite option at this public survey. The only shortlisted car to follow the program specifications from scratch, Karsan’s proposed vehicle won New Yorkers’ vote! 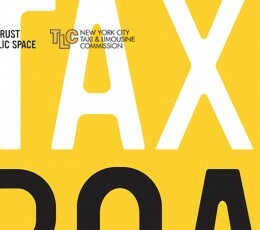 At the project kickoff, the City advised all the prospective bidders to read Taxi07:Roads Forward as reference. By inviting Turnstone to join their team, Karsan benefitted from the subject matter expertise of that report’s co-editor and Turnstone’s content strategy experience across digital and traditional media. 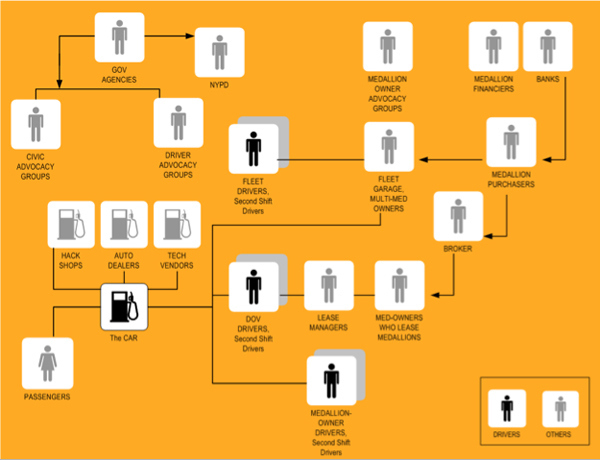 It’s also quicker and easier to program and tailor-make onscreen content than it is to roll out a fleet of cars. There’s more discussion of that in our recent articles, interviews and talks about technology, transit and service design. 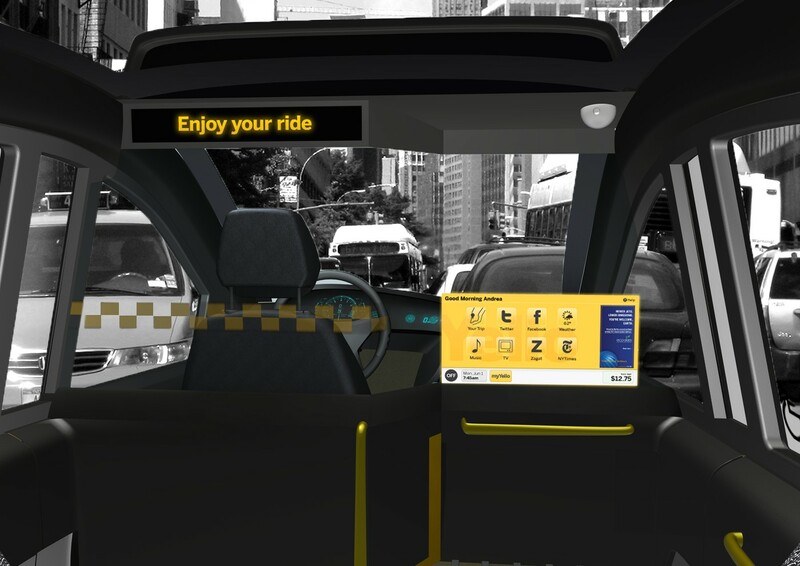 Karsan differentiated their proposal from the competition with a cab for conversation, and demonstrates its understanding of the local economic, geographical and cultural context of a taxi in tomorrow’s NYC. The cab had to be both a New York icon, but also be fit for resale in other cities. How did Turnstone help Karsan meet all these needs in their response to the City? 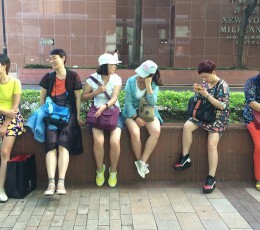 What role did digital media play? – Coherent typography for the taxi exterior and interior, iconic and visible on the street, consistent on in-cab screens and static signage. – Upgrades to the passenger-side screen: In addition to credit card payment functionality, an integrated system that displays a suite of integrated ride-relevant applications. – Customization: An option for New Yorkers and visitors to pre-register online as NYC cab passengers, to set preferences and select content before they climb aboard. 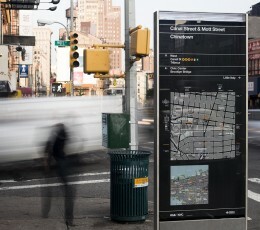 – Location-based advertising: Programming GPS-enabled cabs’ ad screens to refresh en route, to display content to suit specific intersections, match billboards or reference nearby landmarks. The City announced in May 2011 that the contract would go to Nissan. 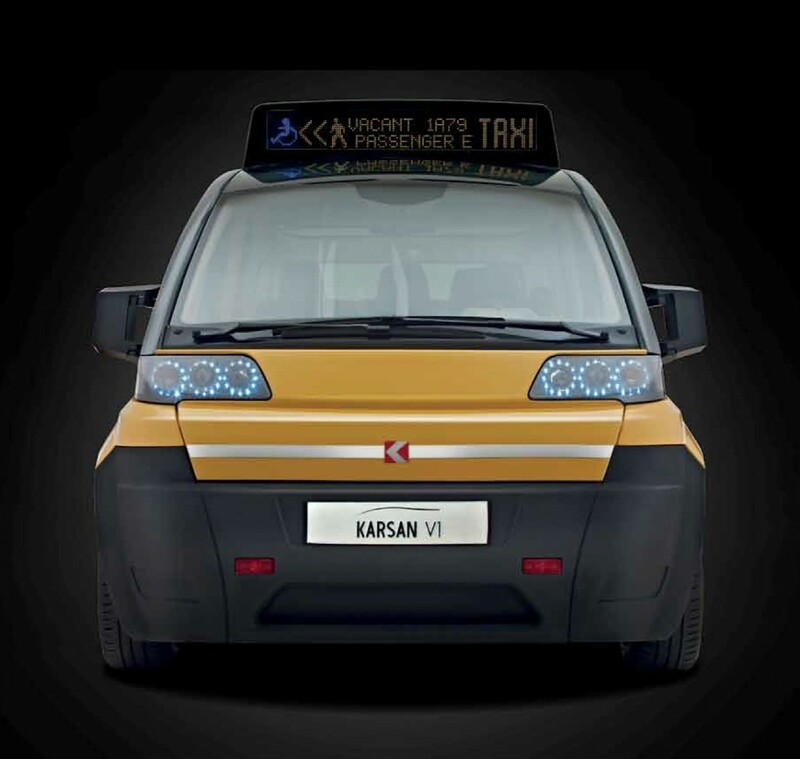 Karsan announced its intention to take their proposed vehicle into production to go to market in several other global cities. 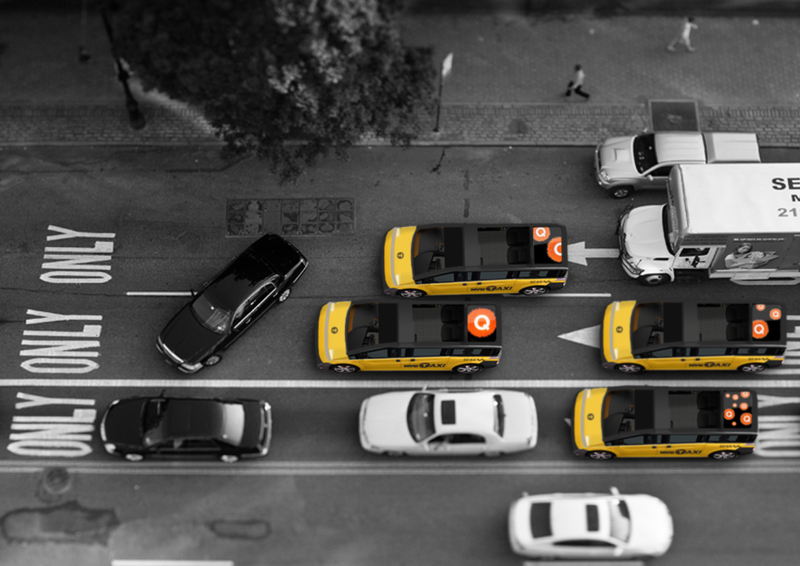 Between then and now, the car manufacturers have been back and forth with the regulators in city, state and federal litigation to fight out whether the Taxi of Tomorrow program should go ahead. In October 2013, the New York State Supreme court overturned the Taxi of Tomorrow program, ostensibly on account of municipal overreach. Confusing, since successive waves of one model (Checkers, Chevrolets, Crown Victorias) dominated the cab fleets, unperturbed by judicial rulings, til recently. 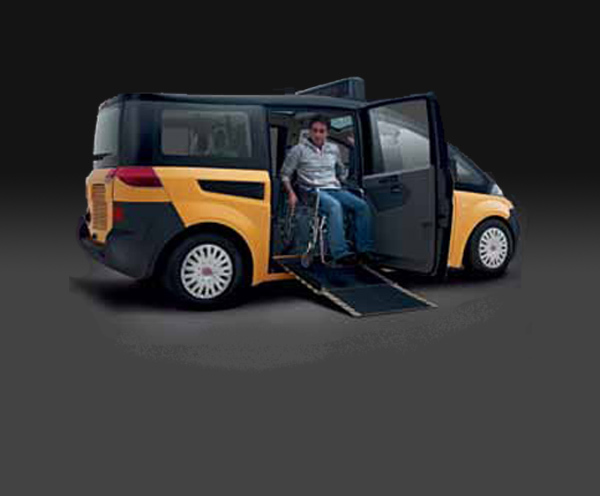 That the Taxi of Tomorrow vehicle of choice was neither wheelchair-accessible, nor hybrid and met with vociferous opposition from the disability lobby, no doubt played its part in the blocking of the program at various stages. While sense prevailed here and there – why bother mandating a single model if it doesn’t represent progress? – an almighty opportunity for service innovation, inclusive vehicle design and for green transit infrastructure for a global city looked to be heading to the scrapyard. As of 2015, Nissan’s retrofitted yellow car is on the road, alongside many other cabs, and yesterday’s taxi of tomorrow is an indistinguishable car hailed by smartphone. That said, Karsan’s vehicle is also in production, for progressive markets overseas, and not just as a cab fleet model. It may yet return to NYC. And so, what Turnstone learned over 6 years covering the brakes, we already absorbed into other projects for public space: Progress is not linear, politics and innovation make strange bedfellows, automotive engineers need experience designers, and, to head in the right direction, Taxi of Tomorrow simply wasn’t radical enough.